Asked – Is there a new sign requirement for pools located in homeowners associations? 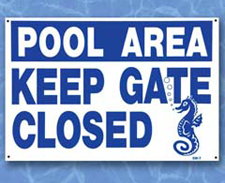 A sign in letters at least 1 inch high and in a language or diagram that is clearly stated shall be posted at the entrance of the pool area which states that persons having currently active diarrhea, or who have had active diarrhea within the previous 14 days shall not be allowed to enter the pools water. The signs are required immediately on all new pool construction; however, on existing pools it will be up to the Environmental Health Services personnel that inspect the association’s pool to provide the deadline for positing the new signs. It would be prudent to have the signs posted as soon as possible.